BLOT-LINE ANCA-3 | TestLine Clinical Diagnostics s.r.o. 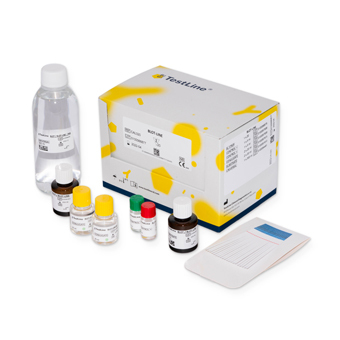 BLOT kit for the detection of specific IgG antibodies to neutrophil cytoplasm and GBM in human serum or plasma. · Antigen used: MPO, PR3, GBM. · Recombinant antigens are applied to the nitrocellulose membrane (i.e. to the respective BLOT‑LINE (BL) strips). · Laboratory test for the detection of antineutrophil cytoplasmic antibodies, confirmatory test to ELISA. 3. Incubate for 30 min at room temperature using a shaker. 6. Incubate for 30 min at room temperature using a shaker. 9. Incubate for 15 min at room temperature using a shaker. 10. Wash twice for 5 min in distilled water.